OK, we admit that Grindstone Neck isn’t really a hiking trail per se, but we at the Mira Monte Inn strive to help our guests see not only the mandatory highlights but also the not-so-well-known areas to hit. Yes, Schoodic Peninsula and Winter Harbor have been frequented much more often the past few years, and this has brought traffic to the area. But this is a good thing because since the Navy left the base out on the tip of the peninsula, Winter Harbor has had little economic activity apart from the park (in fact, the town no longer has even a school!). But here’s the thing, almost everyone heads straight for Schoodic Peninsula upon arriving in Winter Harbor, and that’s great, but it’s also not all. Grindstone Neck is on the opposite side of Winter Harbor from Schoodic Peninsula. It’s an area loaded with money and families who preferred a view of Mount Desert Island as opposed to the actually living on the island. It’s a fair point because the views are spectacular, and almost no one goes Grindstone beyond locals. When taking the ferry boat over from Bar Harbor, the boat passes right by the neck before it lands on the town dock. In fact, the piece of land right across the harbor is, in fact, Grindstone itself. Now, Grindstone Neck isn’t exclusive. Without getting too lost (not a bad thing if you want to do some “house shopping”), there’s a cul-de-sac at the bottom of a hill that has no houses around it. Park here and walk out onto the rocks to get immediate results. 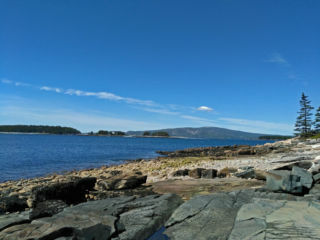 Head right and you’ll get dramatic views of MDI and its eastern mountains. Head left and you’ll get the wonderful coziness of the small islands in the harbor of Winter Harbor itself. To get there, take one of the boats from Bar Harbor and, upon getting off, walk up the street and head left once in the gallery area of downtown. There are several different roads leading to Grindstone, but the road called “Grindstone” is probably the easiest. If you’re driving, when you come into town and hit the T intersection, Schoodic Peninsula is to your left and “downtown”, where the galleries and eventually Grindstone Neck are, is to your right. 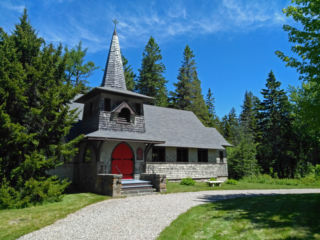 There’s even a nice little church on Grindstone, and because this is Maine and this is Winter Harbor, the doors are always unlocked! To book your stay at the Mira Monte to get more info like this, check our availability calendar here.